A couple of years ago I came across an article in the New Era (I think) where someone gave a few recipes for favorite foods of the Mormon Prophets. Many of the recipes were clearly anachronous, having such ingredients as margerine and baking powder included in early- to mid-19th century recipes. The historian within me just shuddered. It was heresy! Like most of you, I love food. I also love history. 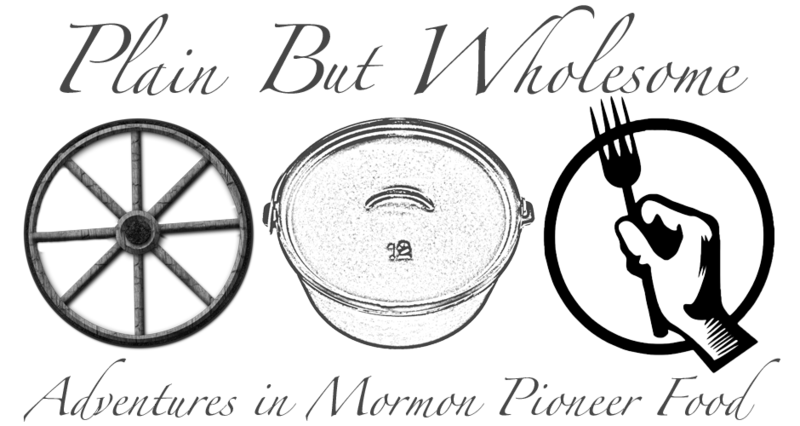 In recent months I've been studying the foodways of the Mormon Pioneers (Utah Territory, 1847-1869). My study is aimed at the publication of a book on the subject. I'm nearing the date when I'll submit a few sample chapters of a book to a lucky publisher (yet unknown) and take another step nearer to being a professional foodie. Until then I hope to use this forum to float a few ideas, and solicit feedback about the design of the book. I'd also like to query all y'all about what recipes you're hoarding from your great-grandmother. These treasures should be accessioned into a reputable institution, not locked away in your private files! Hopefully I can inspire you in your historic food adventures, and you can help me in mine. Is it a deal? "When we camped I made rising and set it on the warm ground. It would be up about midnight. I'd get up and put it to sponge and in the morning first thing I would mix the dough and put it in the reflector oven. With good hot coals the bread or cakes for a hardy breakfast were ready by the time the men rounded up all the teams." Cited in Los Angeles Westerners Corral: The Branding Iron #153, Dec. 1983 "Sourdough: Yeast of the American West" by Donald Duke. Mrs. Titus appears to be using a sourdough culture, based on her references to the fermentation of the "rising" and the sponge process. Mrs. Titus uses a reflector oven for quick baking, instead of a dutch oven or bake kettle. The reflector oven would be better for baking "cakes" or biscuits. If she was baking loaves, perhaps the dutch oven would have been used. Questions remaining: What was the "rising"? Can we find a primary source describing how to make a rising? Was sourdough common among Mormon pioneers, or were they more likely to use soda and saleratus? Was sourdough a trail food, and not continued once pioneers settled in Utah Territory? Nice going, Brock! I have some old family recipes from Danish pioneers. I'll have to send them your way! I'm really impressed with your research, and can hardly wait for the final product. Great work! I want to do a little feature on your blog for the Mormon Times and wondered if I could get you to email me at ejensen at desnews dot com?